When the silhouette of the power Nizamiyat was spread across the land of Hyderabad, Ameerpet was born out of the Jagirdari System to feed the luxurious demands of yet another ruling class in the history of India. At present, Ameerpet is an educational hub. However, even the breeze that blows the ancient dust around reminds the people of the valor and prowess of the Nizam rulers. Thus, if you plan to visit Ameerpet, which you definitely should, you would become awestruck while staring at the brilliancy of the middle ages and the early modern age in India. Nizamiya Observatory: Founded in 1908 by Nawab Jafar Jung, the Nizamiya Observatory was the third and one of the biggest observatories established in India. This observatory stood witness to remarkable spotting and discoveries that have added a new meaning to the study of Astronomy and Aeronautics in India. Though the observatory lies unkempt today, yet the walls boast of a long-lost pride that has made it withstand the passing years with dignity and honor. Salar Jung Museum: The Salar Jung Museum is one of the most famous museums in India. This museum is a replica of the Nizamiyat rule metaphorically because it houses some of the best art and artifacts that you can think of. It is said and believed that all these antiques on display had been collected by the three generations of the Salar Jung rulers. These antiques, which had been traded into the Indian subcontinent mainly from Europe and Asia, prove how powerful and extensive the reach of the Nizam rulers was. Thus, to mark the prowess of the kingdom, after the death of Salar Jung III, the Salar Jung Museum was built to commemorate this royal kingdom. 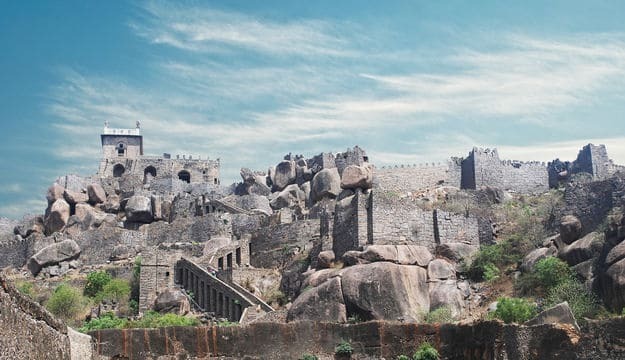 Golconda Fort: Believe it or not, the Golconda Fort was not an invincible fort right from the start. In fact, all that the fort could boast of was the boundary given by basic mud walls. However, in the 12th Century A.D., when the Golconda Dynasty sat on the throne of this region, this fort was renovated and built of granite. The marvelous granite fort was not only artistic in terms of architecture but also extraordinary in the support during warfare. The fort was built in such a way that even a clap at the bottommost entrance of the fort could be heard at the topmost part of the fort where the dignitaries resided. This ensured that the enemies did not escape without being defeated. Thus, tourists love to click several photographs of this magical fort to revel in the history of its unconquerable walls. Thus, a trip to Ameerpet in Hyderabad is not as boring as it once must have sounded to you. These three places are just a trailer to the imaginary Oscar-winning movie that awaits your arrival in the city that still speaks and boasts of the Nizamiyat. So, if, for just once, you want to feel like the royal heir of this kingdom, then stop reading this article and immediately book your tourism package so that you can mark my words once you set your foot upon the bosom of Ameerpet, Hyderabad.